This post is sponsored by CANIDAE® Pet Food and the BlogPaws® Pet Influencer NetworkTM. I am being compensated to help create awareness about the Grain-­Free PURE® line of pet food but we only share information we feel is relevant to our readers. CANIDAE is not responsible for the content of this article. Our 17-year-old cat, Angel, has spent most of her life eating strictly wet food. She refused any dry foods that we served her. It wasn't until this year that she decided she would give dry food a chance. Since she took the plunge into dry food we have been happy to introduce her to CANIDAE® Grain Free PURE, a premium grain-free cat food. What we love about CANIDAE® Pet Food Company is that they have been an independent, family-owned, pet food company since their first batch of pet food in 1996 — over 20 years ago! From their humble beginnings delivering pet food out of the back of their pick-up truck to their state-of-the-art Ethos Pet Nutrition plant in Brownwood, Texas, CANIDAE® has always had one goal in mind: Make the best pet food possible. CANIDAE® Grain Free PURE Cat Food contains no chicken by-product meal, corn, wheat, or soy. What is does contain is a limited ingredient list packed with fresh meat and whole foods. Probiotics are added to support healthy digestion, antioxidants to support a healthy immune system, and omega 6&3 fatty acids to help support beautiful skin and coat. CANIDAE® Grain Free PURE Cat Food is truly the perfect grain-free cat food for promoting healthy digestion. 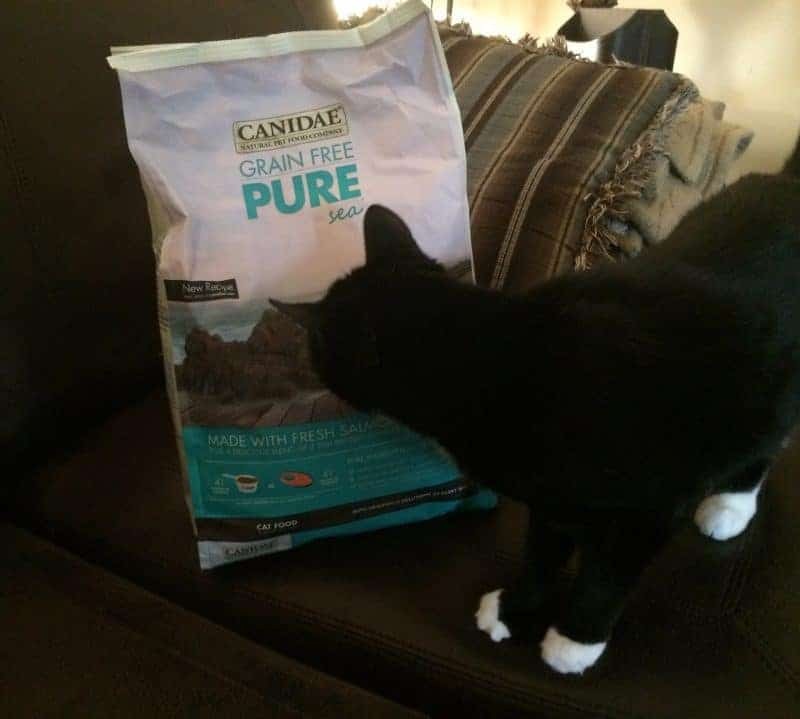 Angel took a sniff of the CANIDAE® Grain Free PURE bag when it arrived and watched me pour the food into her bowl at dinner time. She checked it out, but waited until we left the room to take her first bite (as she typically does – our girl is a shy eater). I could tell that she approved of her new cat food, because the bowl was half empty come morning. 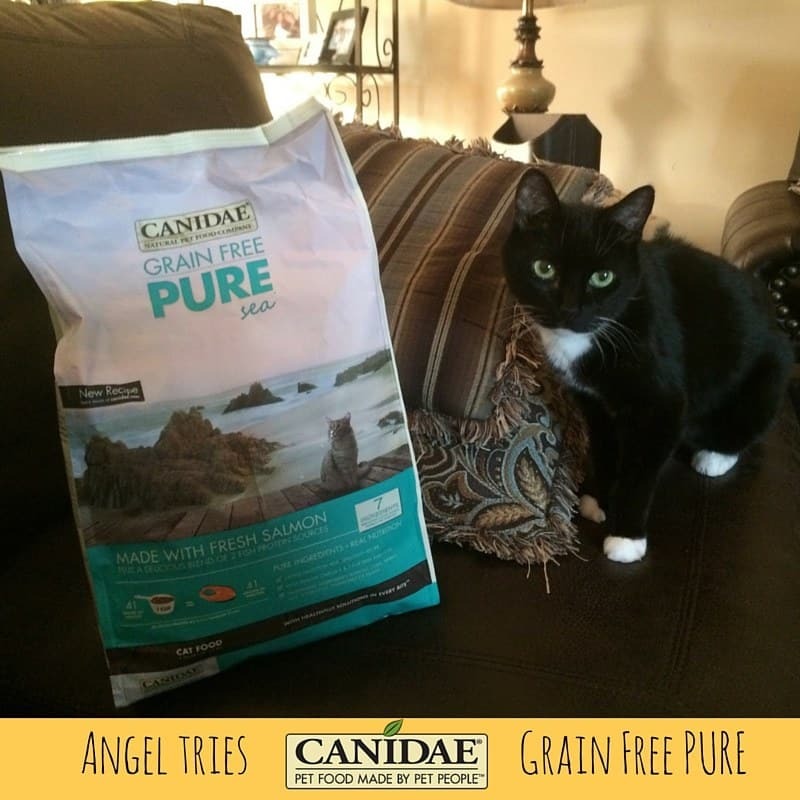 If you knew how picky of an eater Angel is – you would know that her eating CANIDAE® Grain Free PURE says a lot. It must be amazing stuff because even our picky little lady will eat it! 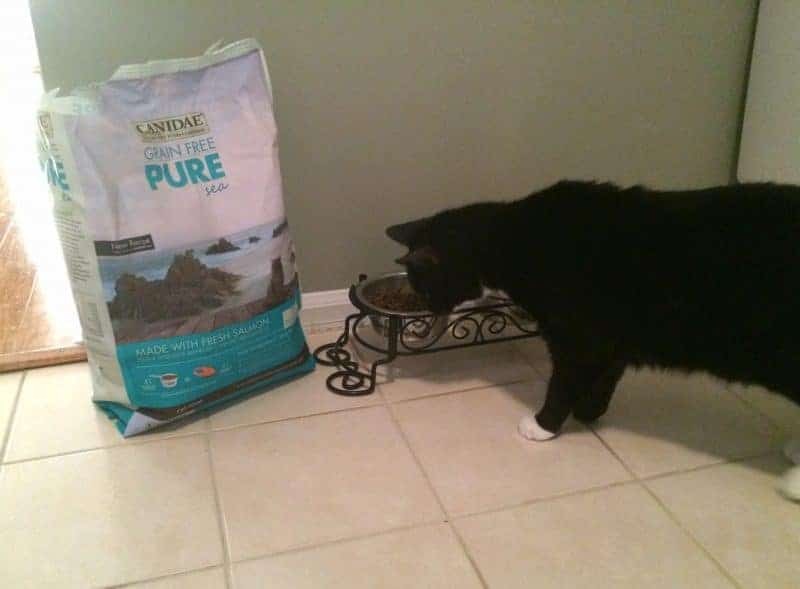 For the past week she has been eating CANIDAE® Grain Free PURE and she seems to enjoy it, and I enjoy knowing that we are giving her the a healthy cat food. I would absolutely recommend checking out CANIDAE® pet foods. You can follow CANIDAE® on Twitter, Facebook, and Instagram. Find out where you can purchase CANIDAE® products by using the handy Store Locator on their website. « Coffee Lover? Now is the Best Time to Enroll With DD Perks! We feed our cat wet food in the evening and dry good in the morning (odd I know). I am in the market for new dry food, as she is getting too fat on the dry food. I wonder if they have samples or really small packages for sale. I waste so much money on testing out food/litter/treats. I’m not familiar with this brand but it sounds like a really good, healthy cat food. I’m glad your beautiful kitty Angel seems to enjoy it! Your cat is so cute! That sounds like a great cat food too. I would like to try this brand for our cat. I think she might like it. This is great for caring for pets. Hmm, I wonder if my cat would eat this. He is SO picky. I have never seen a cat be such a picky eater as this cat! This post makes me wish I had a pet. My husband refuses to let us have one long term, so I just foster dogs. That brand of cat food sounds really good. I don’t have any cats, I know my parent’s cat used different kinds of food when he was living, not sure what kind though. I too avoid grain-based pet food, it is so much better for your pet. Never thought about a grain free cat food when I had a cat. Never heard of this before, but sounds like a great brand! I think I’ll have to drive the three miles north of my house to give my cat a chance at this pet food. I are looking forward to trying this brand,my boy Crowley is a very picky eater he is the worst of my 5 picky furbabies I am still trying to find a wet food for him he will eat more than a week or two. Canidae is an amazing brand & I haven’t tried the grain free yet but think this would be good for all my babies <3 Plus we are moving soon & this is a very hard time for all my cats plus I would love 1 they all like to eat & is good for them. CANIDAE® Grain Free PURE seems like a terrific cat food. When I get another cat I do want the best food and high quality is important. Your kitty is adorable.